Posted on Tue, Dec 27, 2011 : 5:58 a.m.
Students from Eastern Michigan University work on furniture for the new Ecology Center location. Students from a design class at Eastern Michigan University designed and built workspaces for the new offices of the Ecology Center, a 40-year-old nonprofit environmental research and advocacy organization. 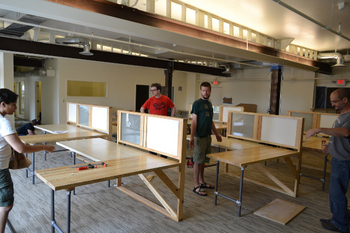 The Ecology Center recently moved into new headquarters at 339 E. Liberty St., known as the Handicraft Building. The collaboration came about from a chance meeting. 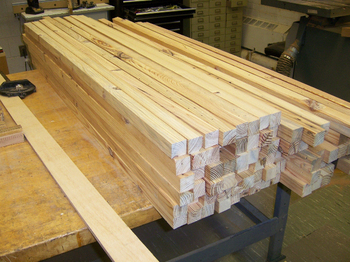 Some of the raw materials used in the workspaces. communal work area that serves about 12 people. It was made up primarily of a work surface, privacy screens, a pin-up bulletin board area, and designed for file cabinets to fit underneath the desk top. In keeping with its mission, the Ecology Center wanted the furniture to be as "green" as possible with the goal to obtain a LEED rating for commercial-interiors for its portion of the building. “LEED certification asks that you reuse as much material as possible from the space,” said DeHoog. They reused wood beams that were torn out of the Handicraft building during renovation, as well as old sprinkler pipes that they made into leg structures for the work stations. Environmentally friendly glues, paints and topcoats were used. The topcoat was made from cheese whey and contained no volatile organic compounds. DeHoog said the reused wood is douglas fir or possibly spruce—the typical building material used when the building was originally constructed-that has an orange color to it. During the one-semester class that began last January, DeHoog and 12 students from his Introduction to Furniture Design class began by holding a few initial design sessions with the architects and Ecology Center staff. This was followed by the class putting together a variety of models that gradually were refined to the finished working model. Construction was finished in April and installed in late June. 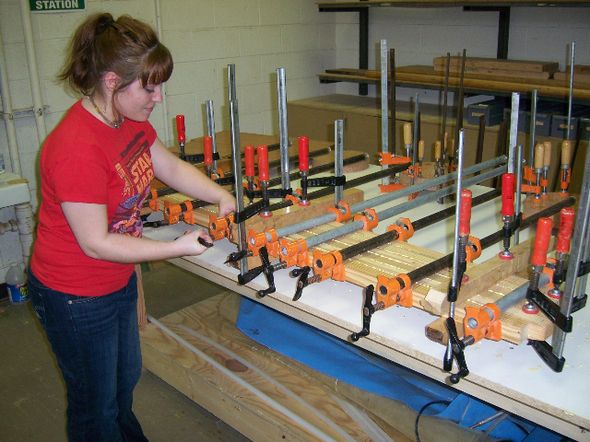 In addition to the technical aspects of reassembling materials, DeHoog says this collaboration taught students how to work together as well as with a client. DeHoog hopes to develop other collaborations each year in furniture design, which is a new concentration at the university. The Ecology Center was happy with how the furniture turned out. “It’s really functional, and with the adaptive reuse of materials, we’re walking the walk of what the Ecology Center stands for,” said Terry Gallagher, communication director at the Ecology Center. Tue, Dec 27, 2011 : 1:53 p.m.
Well done! By students for students!